Select the e-Catalog listed below for a free download. The e-Catalog may be viewed as a stand-alone publication on your computer or in interaction with the VASA project platform on the internet. To receive the benefit for the e-Catalog design you will need to be online. Each VASA e-Catalog contains links to the exhibitions, film/videos, essays, and other materials on the VASA site. To download an e-Catalog select (click on) it below. 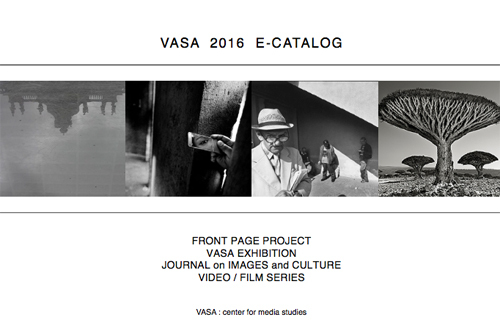 The VASA 2016 e-Catalog contains informaiton and direct links to 2016 exhibitions, Jounral on Images and Culture essays, Film/Video series and other material. To download select the image or text below. The VASA Project in an online center for media studies. The VASA mission is to provide an online platform for disseminating the work of theorist and image makers on a global scale. The VASA community shares an interest in media studies, photography, film/video and sound.